There are some books, whether you agree with the perspective or not, that are just so useful in epitomizing a particular matter or worldview that they become necessary reading. This book, “Contingency, irony, and solidarity”, published way back in 1989, is one of those books. 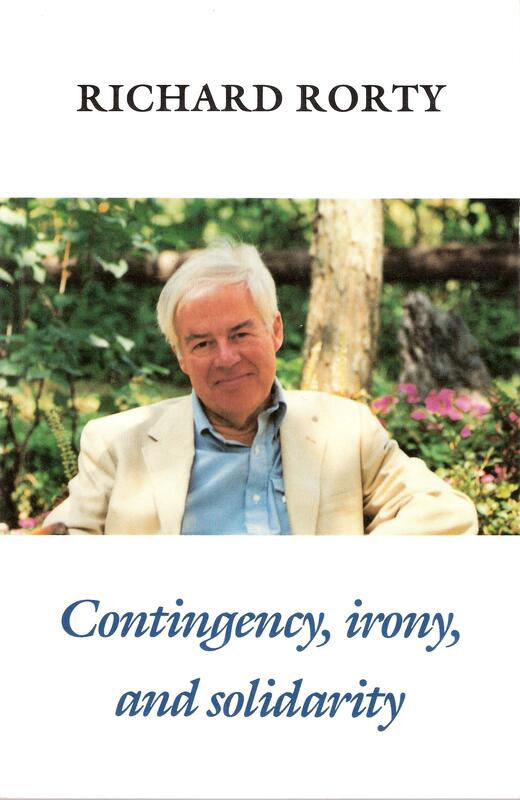 In it Rorty does the average man an immense favor by clearly and unambiguously laying out the operating assumptions of at least one version of the post-modern liberal project. This blurb from the back of the book may help as well. So, what else is new, you ask? This book was written 24 or more years ago! We’ve (you say) been confronting modern-liberals for decades now who seemingly cannot or will not explain how it is that they derive their conclusion that we must yield to their direction, from their seemingly – or so we infer – ultimately nihilistic worldviews. Yet it is a fact that we continue to ask how it is that they think this all works. How, we want to know, do they get an affirmative conclusion, or an imperative statement, from what must be, when we take their other descriptions of reality into account, negative (metaphysical, ontological, logical, take your pick) premisses? Well, this book explains how it is done. Here’s the secret. The secret is that there is no secret. There are no inferences derived. There are no deductions believed to be entailed. It’s all just what they want according to their own, particular sensibilities. Just as we figured. The point of view is anti-foundational, anti essentialist, nominalist, i.e., anti essential natures and natural kinds, in extreme. Therefore there are [so they believe] no real and objectively existing universals to even fill their places in universal categorical propositions. Nice to see one of the princes of the pack admit it so clearly. Yet, the blithe nature of the admission made those decades ago, confirms what nearly everyone – not just intellectuals – by now intuits directly: that the modern political left, so steeped as it is in this theory of meaning, cannot really be argued with. Let Limbaugh fume that words have meanings. The opposition shrug and say ‘our meanings are different from yours’. With them, it’s not as we have repeatedly inferred, a matter of dis-covering an objective reality and reasoning from axioms based on it . What is at issue as far as they are concerned are their sensitivities and their imaginations and their desires: and your reality will bend to their narrative and program, or else. As I said, you will probably not find a more concise, lucid, and unabashed exposition of the doctrines we confront every day as the solidarity pedlars steadily gnaw away at our formal liberties in the supposed name of relieving suffering and humiliation and exclusion – but of just what exactly, they cannot and feel they need not, say. Thinking back, many of us will say that this entire matter feels like a rehash. Wasn’t the debate over the bankruptcy of post-modernism and deconstruction held back in the early nineteen nineties in the universities, the important journals, and the big papers? Didn’t Alan Sokal make public fools of them? Didn’t they fold up their tents and kind of go away? Yes, yes, and no. They not only didn’t not go away, the theorist of 25 years ago has clearly written the psychic program that the modern-liberal Democrat runs today. From academia to the street and polling booth in a couple decades. Once upon a time, even Democrats referred to a common reality, imagined that humans had a moral center in addition to inchoate urges, and could be thought to understand the difference between truth and falsehood and to at least know in their consciences if they were lying or not. Only a fool would make that assumption now. * Note. 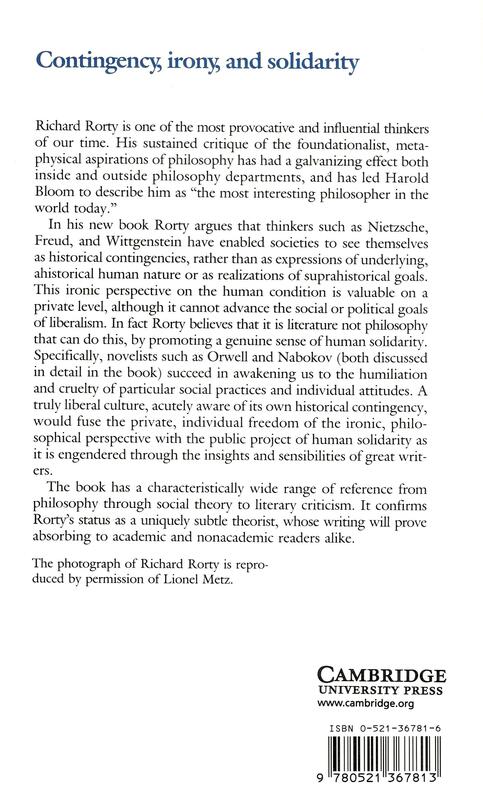 Rorty was involved, his curriculum vitae reports, in analytic philosophy before abandoning it for a kind of deconstructive and ironic pragmatism. Therefore he well knows the traditional conceptual difference between a proposition and a sentence, and his use of “sentence” is, for those of us not yet familiar with him, pregnant with meaning and intent and back references. Get the book … cheap from a remainder bin or used book shop if you can. 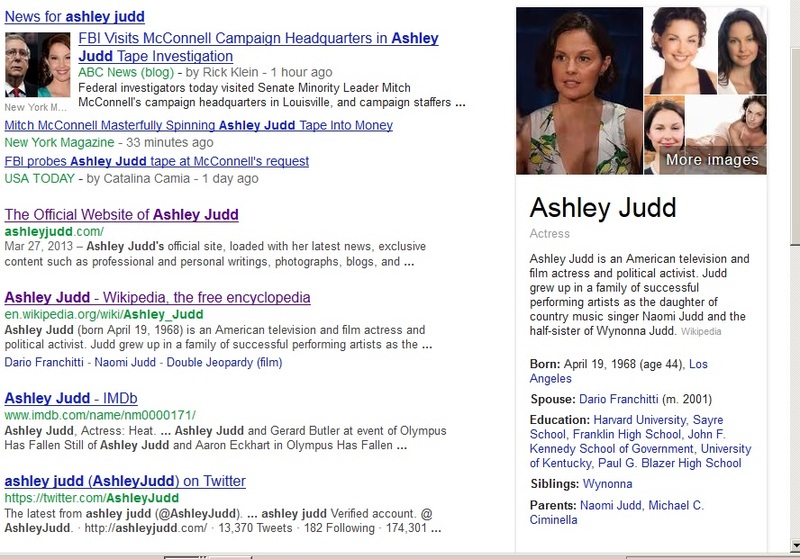 I was not, and I am still not, certain who Ashley Judd really is, or why she has gained as much notoriety as she has. The facts don’t seem to be entirely clear. In order to get some perspective, I Googled her name and in so doing, came across a number of entries; some of which featured a relatively unattractive dull eyed woman. Which I suppose, has only the most indirect and inferential bearing on her potential fitness for public office, but which does fit the general genetic profile when it comes to leftie females as compared with normal and healthy women. Anyway, as one can see from the profile box on the right of the search results capture, she appears – at first glance -to have some very impressive academic and professional credentials. However clicking on Wikipedia, it seems to be a different story. So what she apparently has is a bachelor’s degree in French and women’s studies awarded a decade or quite a bit more, late. What then of that Harvard mention, which tops the list of her educational achievements? You know even over and above the “John F. Kennedy School of Government”? Golly … this Ashley must be a gen -u- wine genius! Judd [received] … a Mid-Career Master of Public Administration degree (MC/MPA) from the John F. Kennedy School of Government at Harvard University in 2010 through the Mid-Career Master of Public administration program (MC/MPA) (an eight credit program with a summer mentorship which typically takes a year to complete in contrast with the traditional MPA program which typically takes at least two years of study). So then, despite what the quick view profile insinuates, Judd did not graduate from Harvard as people usually understand it. Instead, and according to Wikipedia and its sources, Ashley Judd took eight credit hours of a curriculum which bestowed upon her something called a Mid-Career Master of Public Administration, from …. drumroll … The John F. Kennedy School of Government. I don’t think that there has been such a pathetically transparent attempt to burnish a not very sterling curriculum vitae since the obtrusively gynecomastic Keith Olbermann held up his Cornell agricultural station degree (or whatever) before his billowing pinstripes, and blusteringly announced to Ann Coulter and the world that his degree was just as good as her Ivy League version was. And cheaper too! … nah nah nah. Now as regards Ashley Judd. There is undoubtedly much more one could say about this diminished capacity crackpot and her view of life, and what that view of her’s reveals about her fitness to direct her own life, much less anyone else’s … “It’s unconscionable to breed, with the number of children who are starving to death in impoverished countries” … but she bores me, and seems now to have receded as a threat to edified humanity. So, I’ll leave it at that for the present.